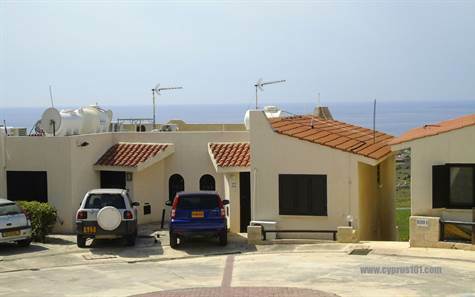 Chloraka Village, Paphos District – This 3 bedroom, 3 bathroom semi-detached townhouse for sale is situated in the popular area of Chloraka, close to the many amenities of Paphos. The property benefits from stunning panoramic sea views and amazing sunsets, which can be enjoyed from both the garden terrace and balcony of the master bedroom. At the entrance is a small hallway with staircase leading down to the living accommodation to the left and the sleeping accommodation to the right. All three bedrooms are double size and have fitted wardrobes. The master has an en-suite shower room and a family size bathroom is accessed directly from the hallway. The living accommodation features a spacious lounge and dining area with two sets of patio windows providing easy access to the outside veranda. The kitchen is separate with an open arch to the living room and is well equipped with fridge/freezer, microwave, cooker, extractor fan and washing machine. A shower room is accessed from a small hallway at the base of the wooden staircase and there is a useful built-in storage cupboard under the stairs. The complex is in the process of being re-painted and is very well maintained by the management committee. The communal swimming pool has a mosaic tile finish plus roman steps for easy access and there are showers to the side. This townhouse for sale is furniture and there are full title deeds. Please refer to MLS#1168 when inquiring. Next → Next post: Kato Paphos Luxury Apartment w/ Deeds – Price Reduction!